Isaac Kehimkar joined the BNHS as a Volunteer 22 Year ago, and since then has been lending his expertise to the Library, Publications, and Members programmes. Currently, he is the Society’s public Relations Officer. His special interests are reptiles and amphibians, insects and plants. His Published works include Moths - an Introduction, Common Butterflies of India, and Incredible Insects, as well as photographs and articles contributed to various nature publications. A book on wild flowers has been a long felt need. This book describes 240 of the common wildflowers seen in the countryside and the plains and forests of India, particularly the Peninsula. The author, Isaac Kehimkar, is a true naturalist, having learned his natural history in the field over a lifetime. He has multiple interests, being well versed in plants, insects, particularly butterflies, reptiles, birds, etc. He is an excellent photographer as the colour plates of the book indicate. 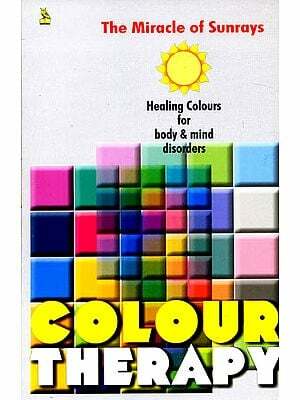 The book gives brief descriptions complementing the colour illustrations. The identification characters are indicated. Common names, both in English and in Indian languages where available, are given as also the distribution and status. A very useful fieldguide to the flowers likely to be seen in the countryside. For amateurs, knowing about Indian wild flowers has been difficult in the absence of a popular guide. That is why, perhaps, the study of Indian wild flowers was not pursued by amateurs as a hobby. 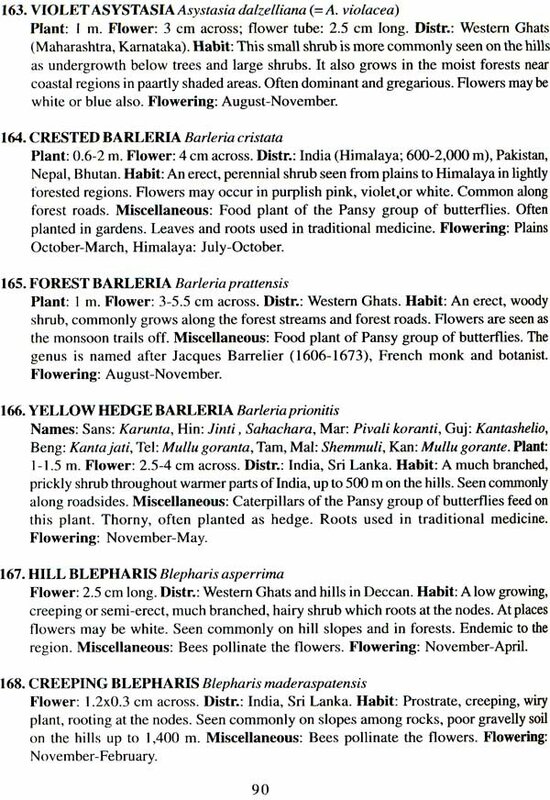 Here is an attempt to popularise India's wild flora, since there is at present no concise, non-specialist guide on Indian -wild flowers. The book is aimed at fulfilling this long felt need. It is hoped that naturalists, botanists as well as nature photographers will find this book useful. 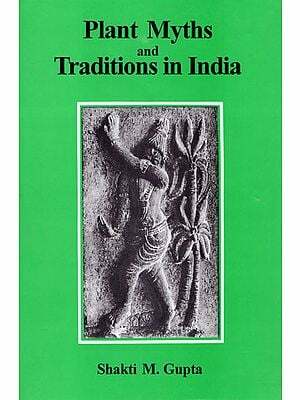 Fortunately, a lot of literature has been published on the flora of the Indian subcontinent. Lately, some fine illustrated books on Himalayan flowers have also been published. However, so far there was no illustrated book on the flowers that one comes across on the wayside, in one's backyard, roadside and forest. Most of the flowers shown here are native to the Indian subcontinent. However, several foreign exotics that have successfully naturalised here are also included. In fact, some exotics are more commonly seen than native plants. 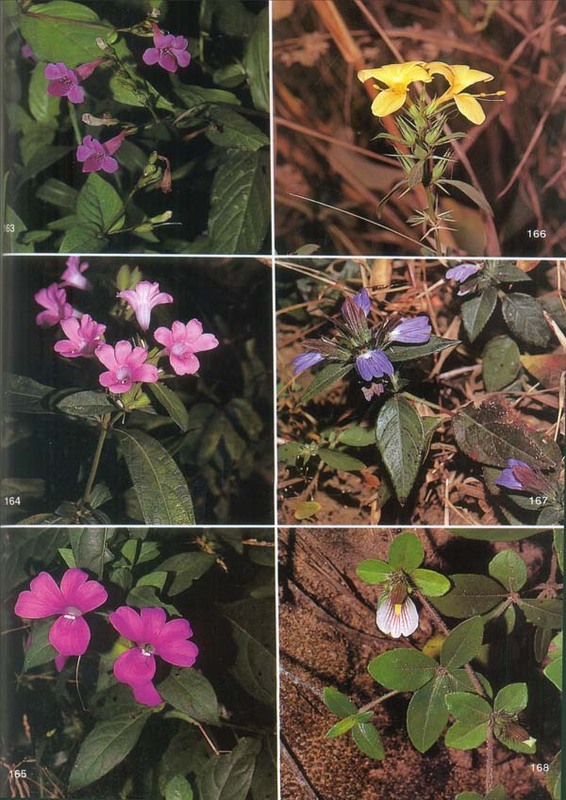 Typical Himalayan flowers are not included in this book. These gorgeous blooms had to be left out only after overcoming a great temptation, since there are already some very good books exclusively on Himalayan flowers. Some rare and endangered species have also been included to draw attention towards the conservation and protection of the rich biodiversity of India. The first obstacle was to give a common English name to some of the flowers which did not have one. Besides consulting botanists and books, plant characteristics and habits were considered to coin new names. And this being the first attempt, corrections and suggestions are welcome. The flowers have been photographed in their natural surroundings, observing the ethics of nature photography. None of the flowers were plucked or arranged to get a perfect picture. The photographs are not to scale; actual measurements are given in the text. Keeping in mind the beginner, the text has been kept simple and non-technical. Botanical jargon has been deliberately kept to the minimum. However, describing the features exactly in appropriate simple words was a problem. Therefore, only when unavoidable such words are used in the text and explained in the glossary. Herbs, shrubs and climbers have been covered, but large trees are not within the scope of this book. However, a few small trees, e.g. the painted thorn bush or false guava have been included. Species here are representative of most of the groups of flowering plants, except grasses and sedges. With the help of the illustrated species, other related species could possibly be identified. 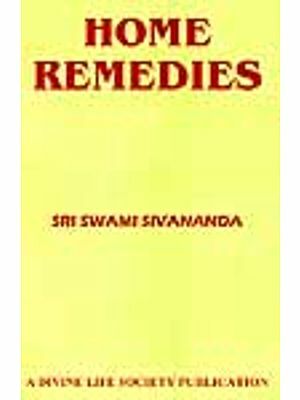 For serious amateurs, a list of references has been provided for further reading. This book has been written for those who enjoy the beauty of flowers in the wild and are curious to know more about them. It is an effort to bring people closer to nature and let them slowly discover the wonders of nature, admire their beauty and value nature's gift to mankind. The earliest plants on Earth were without flowers and did not produce seeds. Instead they multiplied by shedding spores. These simple plants like ferns, mosses and algae exist even today. Later, with the evolution of plants, seeds were developed, but without a protective covering, as in conifers. That is why such plants are called Gymnosperms, which means “naked seeds”. These seeds are not enclosed inside an ovary, but are formed inside cones. A cone is a tight cluster of modified leaves. Usually male and female cones grow separately on the same tree. Male cones are small and produce pollen, which is released into the air to fertilize the larger female cones. On fertilization, seeds mature in the female cones. Today, this small group has plants like pine, fir, spruce, cedar and even the palm- like cycads. Cycads are very aptly called 'living fossils' as they first appeared over 300 million years ago, and have remained unchanged ever since. Male and female cones grow on different cycad plants. However, unlike other gymnosperms, cycads can also multiply through bulbils. Flowering plants had their beginning in the Cretaceous period of the Mesozoic era around 135 million years ago. They flourished in the Cenozoic era around 70 million years ago, which also saw the evolution of mammals and birds. In the course of evolution, flowering plants proved to be the most successful. They could grow in almost every kind of habitat on earth. Flowering plants have evolved to carry out sexual reproduction through their flowers that produce seeds. The seeds develop inside a protective structure called the ovary. Thus the flowering plants get their name Angiosperms which means “vessel seed”. Today flowering plants are the largest dominant group in the plant kingdom. India, being a vast country with wide contrasts in physical features and climate, possesses one of the richest and the most varied floras in the world. The climatic regions of India vary from scorching sun-baked deserts to the wettest regions on earth and from tropical hot deserts to cold alpine regions. Climatic factors are indeed most vital to the composition of plant life. Basically, the climate of a region is determined by its temperature range, precipitation and the intensity of light available. These determining factors depend on the geographical parameters like the latitude, altitude, rain shadow, geology, slope of the land, direction, nature of ocean currents, day lengths and the intensity of sunlight, resulting in different habitats ranging from forests, grasslands, and wetlands, to cold and hot arid regions. All such factors have given India an array of diverse vegetative cover. Climate is one of the key factors that influence the vegetational composition of a region. Often called a land of contrasts, India has a great variety of climatic zones. During winter, the land experiences general dryness as the flow of the surface air is from the land towards the sea. Later on, the land warms up with the summer sun, causing the inflow of moisture-laden winds from the sea to the land, which results in the onset of the southwest monsoon. This is a major decisive season in the context of plant cover. During the monsoon, along the coast and on the hills, humidity rises as high as 80 to 100 percent. Frequent rains provide ideal conditions for plant growth, both for seasonals as well as perennials. The southwest monsoon prevails mainly from June to September. Monsoon starts rather early in the Andaman Islands and Sri Lanka, while on the mainland, it begins in the far northeast and Kerala around late Mayor early June. Then it moves northwards, causing rainfall in the Indian subcontinent. Rainfall varies from as high as 1,092 cm at some places in the northeast and about 890 cm in some parts of the Western Ghats to as little as 10 cm of rain for an entire year in the arid northwest region. Between the winter and monsoon, there are the hot weather months March, April, and May, and soon after the rains, October. Humidity in winter and summer is much reduced. Himalaya gets summer rain, when monsoon clouds from the Bay of Bengal and the Arabian Sea cover the eastern region first, causing more rains than in the western Himalaya. Rain shadow areas shielded by mountain barriers receive scanty rain. Relatively, the western Himalaya gets more rain during the winter. Regions like the Thar desert in the northwest experience extreme temperatures, going up to 50°C in summer, while winter temperatures drop to freezing point. Arctic conditions prevail almost throughout the year in some of the Himalayan and Trans-Himalayan regions. On account of their proximity to the sea, coastal areas experience less variation in temperature, resulting in a more equable climate with an average temperature about 27 QC, while the Deccan peninsula and central India have extreme temperatures. The Western Ghats form a massive barrier which prevents most of the southwest monsoon from reaching the Deccan plateau, bringing this region under rain shadow. However, during winter, this region receives rain between October and mid December. At the same time in the north, the plains receive light showers and there is snowfall on the mountains. Next to the climate, the physical features of the land are an important factor in determining its plant cover. Few countries in the world have physical features as diverse as India. Altitude is an important decisive factor to influence the vegetation of the land. In the north is the Himalaya that ranges from Kashmir to Arunachal Pradesh. It has some of the tallest mountains in the world. From the Himalaya, several rivers flow into the. Indogangetic plains. In the west, the Indus and its tributaries flow in a south westerly direction towards the Arabian Sea, while the Ganga and its tributaries drain the fertile plains of Uttar Pradesh, Bihar and Bengal before emptying into the Bay of Bengal. In the northeast, fast flowing Himalayan rivers come thundering down from the foothills and through the flood plains of Assam, to join the mighty Brahmaputra, which finally meets the Ganga as it flows towards the Bay of Bengal. The basin of the Ganga, Indus, Brahmaputra and their tributaries form the alluvial plains between the Indian peninsula and the Himalaya. The Indian peninsula, south of these plains forms a triangular tableland intersected by rivers. Along the west coast are the Western Ghats, the mountain range which runs more or less parallel to the coast facing the Arabian Sea. Between the sea and the Ghats lies a narrow, gently sloping coastal region that receives a good amount of rain and therefore is rich in floral diversity. From the Western Ghats there are' prominent offshoots like the Nilgiris. Similarly there are the Anaimalai, Palni hills and other south Indian hill ranges. While the rainy western sides of the Ghats have typical evergreen vegetation, their drier eastern slopes have semi-evergreen and deciduous vegetation. Along the east coast, there arises a small range of hills known as the Eastern Ghats. In the north is the Aravalli range and then the rising uplands of Central India. Between these hill ranges, lies the central Deccan Plateau intersected by rivers like the westward flowing Narmada, and the Godavari, Krishna and their tributaries that flow towards the Bay of Bengal. Blessed with a wide variety of physical features and climate, India has probably the richest and most diverse plant life compared to countries of a similar size. 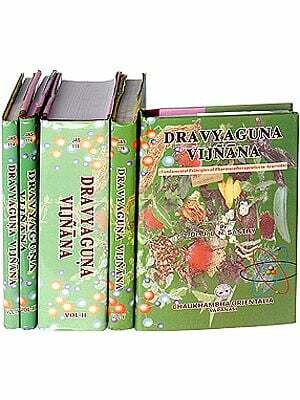 The vegetation of the Indian region is broadly classified into sixteen major types here. The Moist Tropical vegetation is classified into four types. (1) Wet Evergreen type is seen in the south as well as in the north. In both regions, the vegetation is almost alike. Evergreen forests have typically tall straight trees, the majority of which are evergreen. These trees often have a trunk buttressed at the base like a tripod to support them during storms. Trees in this type of vegetation are festooned with mosses, ferns and orchids. Canes, screwpines, tree ferns and woody climbers (lianas) are common, and wild banana is seen on the hill slopes. In the south, this type of vegetation is seen along the Western Ghats, in the Andaman and Nicobar Islands and in neighbouring Sri Lanka. In the north, the Northeast region of India, and the neighbouring Bangladesh and Myanmar have wet evergreen vegetation. (2) Semi-Evergreen vegetation occurs between the tropical and moist deciduous and therefore combines both these types. This vegetation is seen on the eastern slopes of the Western Ghats, the Andamans and Nicobars, and the foothills of eastern Himalaya. (3) Moist Tropical Deciduous type vegetation is further divided into: (a) moist teak bearing, (b) northern moist deciduous forests and (c) southern moist deciduous forests. Typical dominant trees are red silk cotton, mango, rosewood and some teak. Most larger trees have buttressed trunks and along with other smaller trees turn leafless in the dry season. The undergrowth is of bamboo, climbers and other shrubs. A good number of orchids too are seen in these forests. This type of forest vegetation occurs throughout India in suitable habitats. (4) Littoral and Swamp type of vegetation occurs in the coastal region along the river estuaries, creeks, inlets and islands. Such vegetation is seen in three zones: (a) Mangroves are seen in saline swamps. These salt-tolerant plants have breathing roots, an adaptation for aeration. On the eastern coast, mangrove, date and nipa palms are prominent among the tidal forests of West Bengal and Orissa. Bulletwood (Manilkara sp.) occurs in the littoral forests of the Andaman and Nicobar Islands. (b) Vegetation of coastal sand dunes has plants like Crotalaria verrucosa, Launaea pinnatifida, mangrove beanstalk (Derris trifoliata), and goat-foot glory (Ipomoea pes-caprae). Shrubs like screw pine (Pandanus sp.) are typical. (c) Vegetation beyond the high tide mark is more or less similar to the adjoining mainland.